A short, very concise guide to carrying out hands only CPR …no ‘kiss of life’, just hands on chest compressions. Peter Yexley takes you through the process of activating the emergency services, dealing with the 999 operator effectively and assessing the patient, determining if CPR is required and delivering good quality chest compressions. It also covers locating and using a public access defibrillator – dealing with myths and facts and generating confidence to deliver a shock to a patient in cardiac arrest before the arrival of the ambulance. It is all geared to instructing the reader how to play a considerable part in the ‘Chain of Survival’. • Early Recognition of cardiac arrest. • Early defibrillation – AED. • Early advanced life support. A low cost life saving publication. The contents is based on the assumption that the reader has minimum or no experience in using a public access defibrillator, it eases the mind about fears of doing it wrong, being at risk in the rain or on snow and covers many essentials such as preparing the chest for the AED. 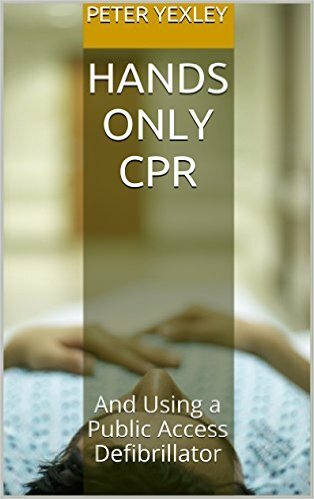 Not a big heavy read by any means but packed with essential information to provide the reader with confidence in both hands-only CPR and using an AED.